There’s still time to register for the Greater Miami Jewish Federation Women’s Event, featuring Emmy Award-winning actress Debra Messing! Join hundreds of women for an inspirational and empowering morning on Friday, November 18. Chaired by Corey Feinsilver, this Women’s Philanthropy event will take place at the Hilton Miami Downtown, 1601 Biscayne Boulevard. Brunch buffet will begin at 9:30 a.m. The program will start promptly at 11 a.m. and conclude by 1 p.m. Click here for details and to RSVP now. Did you know that every Federation-designated donation between $25 and $10,000 made through GiveMiamiDay.org on Thursday, November 17 will result in a bonus gift for our campaign? Last year, you helped us raise more than $500,000 in a single day! All funds go toward the Annual Federation/UJA Campaign, which supports more than 100 programs and agencies that serve Jewish needs in Miami, in Israel and in more than 70 other countries worldwide. Why not make your annual contribution on this day of philanthropy and take advantage of this special philanthropic opportunity? For more details, click here. Join Federation on Wednesday, November 30 at Temple Beth Sholom to celebrate the five-year anniversary of Create a Jewish Legacy (CJL). Your generosity and commitment to creating a vibrant Jewish future has resulted in more than $40 million in estimated expected gifts to our community. CJL is sponsored and presented by The Foundation of the Greater Miami Jewish Federation and is a collaborative effort between 15 area agencies, synagogues and day schools. This endowment program is designed to enable donors to fulfill their philanthropic goals while strengthening Miami’s Jewish community, now and in the future. To learn more about CJL, click here. Mazel tov to Israel’s Desert Iris Hotel in Miami’s partner city of Yerucham, which was recently awarded 4-star status by the Israel Ministry of Tourism! 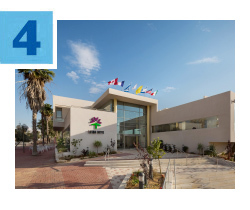 With the Miami-Yerucham partnership's plan to help the Negev city become a tourist destination, along with Federation support, a one-story office complex was remodeled to create an all-suite, family-friendly hotel. Since its opening in 2014, the property has enabled tourists to enjoy more time exploring the sights and attractions of the central Negev region. As a social venture project, the hotel will help support educational programming in Yerucham. To learn more about Miami’s partnership with Yerucham, click here. 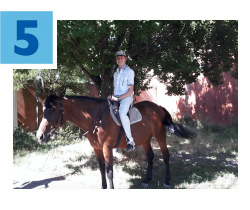 Thanks to your support of the Annual Federation/UJA Campaign, Ukrainian children with special needs are participating in a unique horse therapy program. Through the efforts of Federation’s overseas partner agency, the American Jewish Joint Distribution Committee (JDC), five children with developmental and speech delays, as well as neurological disorders, will meet at the Odessa Horse Club for innovative healing techniques over the course of four months. The children’s families also receive additional support in the form of food cards, medications, psychological rehabilitation and more from Odessa’s JDC-supported Jewish Family Service. Read more. Greater Miami Jewish Federation thanks our veterans for their service.